B|E Retrofit is a commercial and institutional contractor specializing in weatherization and mechanical insulation services for colleges and universities, commercial buildings, K-12 schools, municipalities and the industrial sector. Our ESCO, Design-Build Engineer, Building Owner and Contractor partners have come to rely on B|E Retrofit for professional engineering and project management, an uncommon level of service from our in-house installation staff and a unique partnership approach. At B|E Retrofit, we take a hands-on approach to the audit process, you’ll find us up on ladders and down in crawl spaces conducting a full six-sided building assessment, analyzing the envelope for air infiltration and heat loss and evaluating mechanical systems for distribution losses. Learn more about our comprehensive auditing and project design process. From our Investment Grade Audit Report to our As Built documents you can expect customized and transparent documentation that you can quickly and confidently incorporate into your deliverables to building owners. Read more about our customized reports. Our on-site managers and trained in-house teams are ready to solve problems as they occur and ensure a smooth installation process with minimal disruption to building occupants. 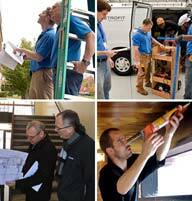 Read more about working with B|E Retrofit’s in-house team of project managers. At B|E Retrofit, we are building envelope specialists, trained to identify and resolve air leakage and heat loss quickly and efficiently. Read more about our in-house teams, dependability and specialized weatherization methods. Whether you are a Project Developer or Project Manager at an ESCO, a Design-Build Engineering Firm or a Contractor, we understand the challenges you face at each phase of a project and align our communications, deliverables and processes to exceed expectations.